In Alabama, if you are the parent or guardian of a child and require child support payments, you may represent yourself in civil court. The Alabama Administrative Office of Courts maintains a website where all relevant forms can be filed. This articles discusses the form CS-2 which is filed to petition for child support. Alabama Petition For Support CS-2 Step 1: Enter the number of the court you are appearing in, the name of the county, and the names of the plaintiff and defendant. 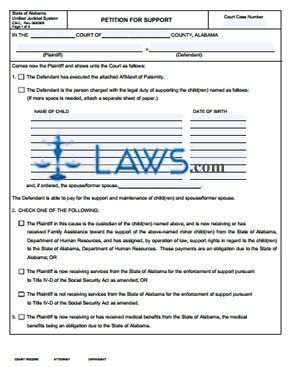 Alabama Petition For Support CS-2 Step 2: Question one asks you to either indicate if you have attached an affidavit of paternity completed by the defendant or to list all children for whom you are seeking support from someone with the legal duty of paying it. Include their dates of birth and the name of any spouse seeking support as well. Alabama Petition For Support CS-2 Step 3: In response to question two, check the box next to any statements concerning whether you are receiving assistance with enforcement of any existing support agreement already. Alabama Petition For Support CS-2 Step 4: In response to question three, indicate with a check mark if you are receiving or have ever received health benefits from the state of Alabama. Alabama Petition For Support CS-2 Step 5: On page two, indicate whether the plaintiff or the state of Alabama is responsible for filing this petition. Alabama Petition For Support CS-2 Step 6: In response to question four on the second page, indicate whether the defendant should be required to pay for the children's medical expenses or to include them on their health insurance coverage. Alabama Petition For Support CS-2 Step 7: In response to question five on the second page, you may enter the total of any child, spousal or medical support you feel the defendant is negligent in not having already paid. Alabama Petition For Support CS-2 Step 8: Enter any other requests in response to question eight. Alabama Petition For Support CS-2 Step 9: The plaintiff or attorney completing the form should sign and date it, along with providing their address and telephone number.